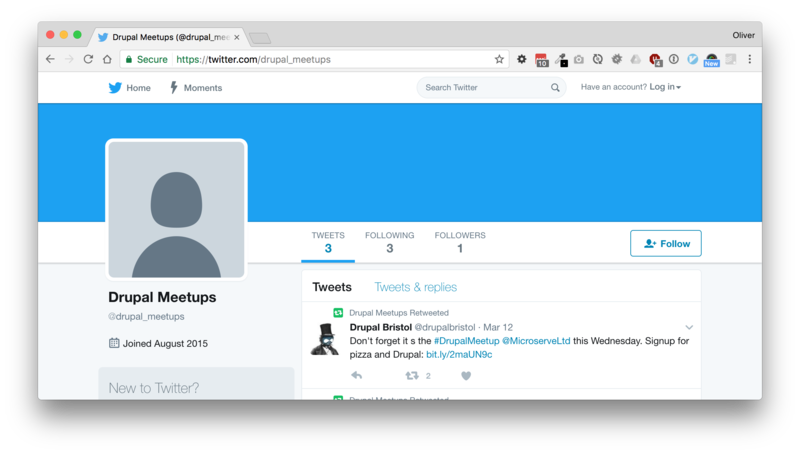 The Drupal Meetups Twitterbot is a small project that I worked on a few months ago, but hadn't got around to promoting yet. It’s intention is to provide one Twitter account where people can get the up to date news from various Drupal meetups. It works by having a whitelist of Twitter accounts and hashtags to search for, uses Codebird to query the Twitter API and retweets any matching tweets on a scheduled basis. If you would like your meetup group to be added to the list of searched accounts, please open an issue on the GitHub repo.